Grevillea pinaster is usually a dense, upright shrub that in our cold climate garden reaches height of one and a half metres. We also have a lower, spreading form that is less than one metre high. Leaves are up to 6 centimetres long; light green, narrow, flat and linear. The flowers are carried in terminal clusters and are pink or red. Our specimens have red flowers. The flowering period extends for many months and in fact plants carry some blooms for most of the year. Plants appreciate an occasional light pruning. 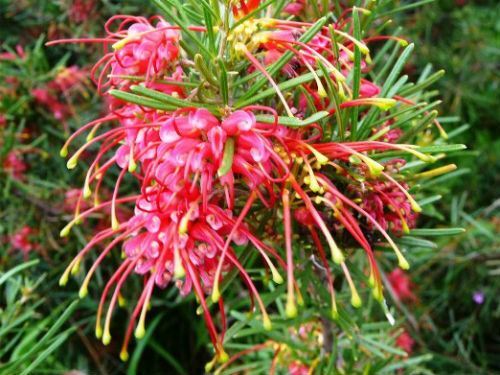 Grevillea pinaster is a native of Western Australia and is found north of Perth. The species propagates readily from cuttings. This ease of propagation has allowed this beautiful species to be spread throughout our garden. Its ease of propagation, attractive, long-lasting flowers and the frequent visits of Eastern Spinebills to the nectar-rich blooms make Grevillea pinaster one of our favourite grevilleas. The low, spreading form could be grown cascading down embankments.